This is a small taluka in Vidarbha, Maharashtra. To the north, not far away, and visible on the horizon, is the line of hills called the Sahyadriparbat, which is also called the Ajanta range after the site with the remarkable frescoes. Also due north is the city of Akola, and a little farther away north-east is Amravati, named after Amba whose ancient temple the old city, with more than 900 years of recorded history, is built around. To the west, in a nearly direct line west, is Aurangabad. To the south had stretched, not all that long ago, the dominions of the Nizam of Hyderabad, to which this little taluka had once belonged. Sengaon is the name of this taluka (an administrative unit unimaginatively called a ‘block’ by the administrative services, elsewhere a tehsil or a mandal) and today it is one of five talukas of the district of Hingoli, which itself is only very recent, for before 1999 it was a part of the district of Parbhani. But Hingoli town is an old one – its cantonment (old bungalows, large compounds) was where the defenders of this part of the Nizam’s northern dominions resided (over the frontier had been Berar), and there was a large and thriving market yard here, as much for the cotton as for the jowar. The villages of Sengaon are mostly small and agricultural, which is how the entire district was described in the district gazetteer of the 1960s. 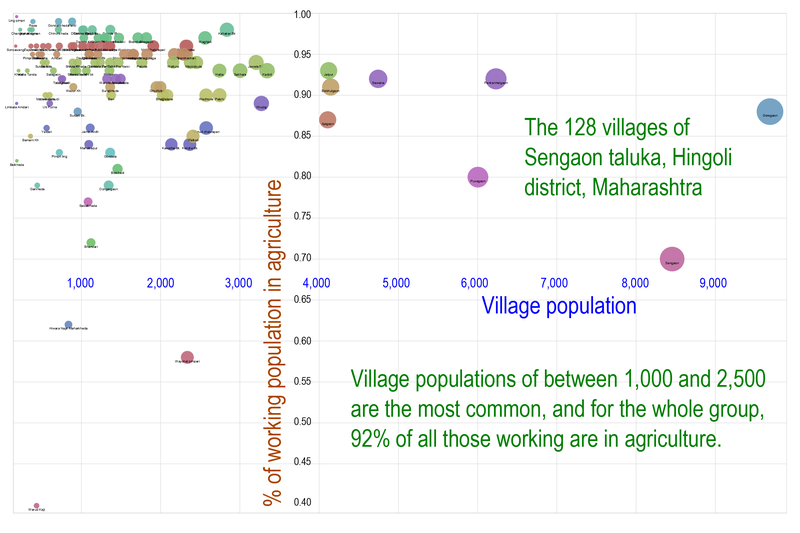 There are today 128 inhabited villages in this little taluka, and this chart (click it for a full size version, data from Census 2011) shows how their populations depend almost entirely on agriculture – for the group of villages, 92% of all those working do so in the fields, whether their village is as small as Borkhadi or Hudi, or as large as Sakhara or Palshi. There were Bhois here (and still are), the fishermen and one-time litter-bearers, there are ‘deshastha‘ Maratha Brahmins, there are ‘Karhada‘ who take their name from Karhad, the sacred junction of the Koyna and the Krishna in Satara district, there are the former leather-workers and rope-makers called the ‘Kambhar‘, there are the weavers who are the ‘Devang‘ (with their four sub-divisions, and themselves a division of the great Dhangars or shepherds), there are the ‘Virasaiva‘ or the ‘Shivabhakta‘ or the ‘Shivachar‘ (all Lingayats) who have for generations been traders and agriculturists. There are the ‘Pata Jangam‘ still who must lead a celibate life and could be distinguished by the long loose roseate shirts they wore and who spent their days in meditation and prayer, there were the ‘Mali‘ the fruit and vegetable growers the gardeners and cultivators (and in times past their society was divided according to what they grew so the ‘phool Mali‘ for flower the ‘jire Mali‘ for cumin seed and the ‘halade Mali‘ for turmeric), and there are the Maratha – the chief warriors, land owners and cultivators – and the 96 families to which they belong, there are Maheshvari Marwaris, the ‘suryavanshi‘ or ‘chandravanshi‘ Rajputs, the Lambadi who at one time were grain and* salt carriers but also cattle breeders and graziers, and the ‘Vadar‘ or stone and earth workers. This is who they are and were in the taluka of Sengaon, beyond and away from the dry and terse descriptions contained on government beneficiaries lists and drought relief programmes. They know well their trees in the expansive grasslands of the north Deccan – the Indian bael, the ‘daura‘ or ‘dhamora‘ tree, the ‘saalayi‘ whose bark and gum resin treats all sorts of ailments, the ‘madhuca‘ or mahua, the amalaki – and do their best to protect them; the twigs and sticks that fuel their ‘chulhas’ are those which fall to the earth.